Praia is the capital and largest city of the island nation Cape Verde, an archipelago approximately 400 miles west of Dakar, Senegal. The city has a population of 127,899 people and it is the home of over 90% of the nation’s population. Praia lies on the southern coast of Santiago Island. The city experiences a mild desert climate due a short monsoon season and the surrounding Atlantic Ocean moderating the weather. Average rainfall in the area is about 10 inches and occurs mainly during July, August, and September. Praia is the seat of government as well as the country’s largest port. Main exports through the port are coffee, sugar cane, and a variety of tropical fruits. The history of Praia dates back to 1615 when it was originally founded by Portuguese explorers and named Praia de Santa Maria. The city evolved into a port that was often times used for illegal trade including in later years the slave trade. In 1770 the capital was transferred to Praia from Ribeira Grande because Praia was growing more rapidly and was considered healthier. Despite its new designation, Portuguese colonial officials completed the first major dock for the port only in 1863. Cape Verde gained its freedom from the Portuguese on July 5, 1975 after an almost 15 year war for independence which was linked to anti-Portuguese struggles in Guinea-Bissau, Angola, and Mozambique. All four nations became free in 1975. Upon independence Praia became the official capital of the new nation of Cape Verde. Praia has a cosmopolitan culture. People of African ancestry are the majority in the city, mainly because of the centuries old slave trade and plantation economy of the islands, but there is still a significant European population including many Portuguese. The African influence predominates in the languages, food, and social patterns. The European influence can be seen in the Catholic religion, urban architecture, and clothing. Like other former Portuguese colonies there is a significant Kriol (creole) culture as a result of the intermarriage of many Portuguese and Africans. The city of Praia celebrates many festivals at different times during the year. The Praia Kriol jazz festival is celebrated from April 10-13 to promote Creole inspired music from all around the world. In addition to concerts, the festival includes documentaries, lectures, and workshops for visitors. The festival of Nossa Senora de Graca honors the first patron saint of the city and is celebrated on August 15th. In May the Gamboa festival involves a number of musical performances. The celebration of popular saints, also known as Tabanca, is held in between June and July. People from different parts of the island converge on Praia and a colorful procession is led by the “king” and “queen.” The people of Praia also have significant links to the overseas Cape Verdean population in the United States which began settling in Massachusetts in the 19th Century. Africa Travelling, "Travel in Praia-Cape Verde," Travel in Praia - Cape Verde - Africa - History. http://www.africatravelling.net/cape_verde/praia/praia_history.htm; Mapsnworld, "Praia," http://www.mapsnworld.com/cape-verde/praia.html; Maps of the World, "Praia Map." Praia Map. 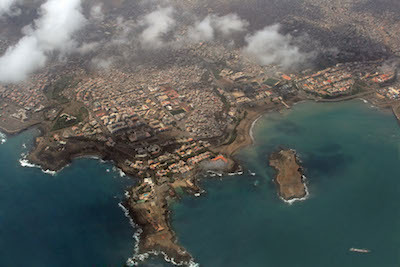 http://www.mapsofworld.com/cape-verde/praia.html. Verde – Africa – History. Maps of the World, "Praia Map." Praia Map.